Sous Vide immersion cooking is an increasingly popular and trendy cooking style among foodies and food enthusiasts. Especially for cooks who love precision and accuracy when it comes to the temperature and tenderness of their meats, sous vide cooking has grown in popularity. "Under vacuum" in French, sous vide includes enclosing food in an airtight container or bag and giving it a hot bath in water. The sous vide process is quite like thawing frozen meat (placing meat in a plastic bag and letting it soak in hot water). As the water heats up, it circulates slowly to an accurate, consistent temperature that the cook controls. This precision with temperature allows the cook to gauge their own level of doneness for the meat. The meat is always juicy and it never comes out "too dry" when such accurate temperature control is allowed. The only con is that it can take a very long time to cook. Sous vide is not for impatient cooks. People who love sous vide highly recommend a rib-eye steak, especially for first-time cooks using the method. The water must be set to 129°-130°, and soak the bagged steak in the water for a medium-rare delight. The center is tender and thoroughly juicy, too. The outside can be seared to perfection to replicate a steakhouse treat. Again, the only con is the time constraint. Sous vide takes significantly longer than conventional methods, however, with some forethought and planning in advance, the method is very much worth the time. Like a slow-cooker, meals must be planned. On the other hand, sous vide cooking is extremely affordable. Sous Vide Precision Cookers range from $55.99 -$231.30 , though the method might feel foreign and strange to the average cook at home. 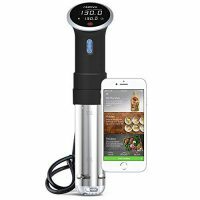 The sous vide recipes available are primarily targeted to experienced, perfectionist cooks who have ample time to experiment in the kitchen. The average, mid-level cook might not want to dedicate the time, money or effort into a method they aren&apos;t certain produces delicious food. A good start is to figure out how to fit sous vide into a busy schedule. All it requires is a little thought and planning beforehand. To start, choose a cut of meat that is both economical and easy to work with. A pork shoulder or beef chuck roast is a wonderful start. If you plan ahead and have a decent sized freezer, buying multiple steaks at once and keeping them frozen is also ideal. Or you can cook mass amounts of steaks sous vide for 24 hours, and then divide them into smaller sizes and keep them frozen. This creates a nice stash of steaks ready to be thawed and served, which can take 60-75 minutes, depending on the size. Once the planning is underway, sous vide can become like any other cooking method. The only limit is the cook&apos;s imagination and creativity in the kitchen, and with meats like beef and pork. A nice steak with homemade bÃ©arnaise sauce, red mashed potatoes with seasons, and some boiled carrots with brown sugar and cinnamon make for a delicious, weekly dinner treat. Beef chuck, and pork shoulder are tough cuts at first, but after being slow-cooked for hours, they fall apart with beautiful tenderness exactly like a pot roast. 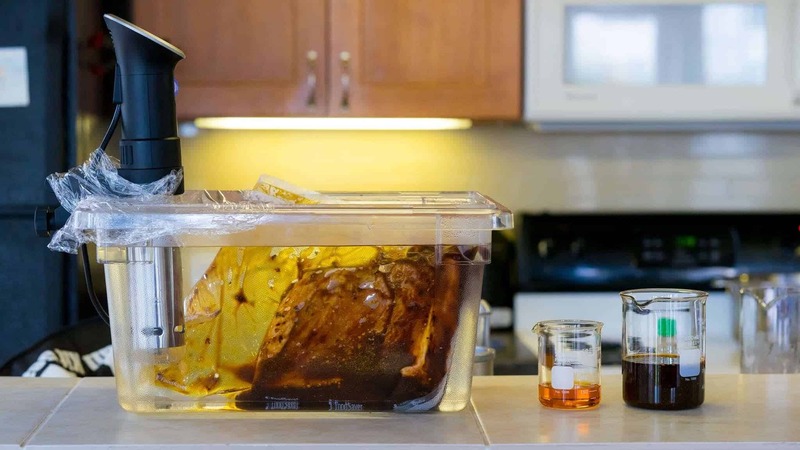 However, sous vide is slightly different, the muscles in the pork shoulder keep their integrity in sous vide, meaning the flavor and texture remains, but the collagen breaks down. This is a recipe for a wonderful, extremely tender cut of meat. Slow-cooking is exactly that: it slowly releases the flavors, and the temperature, without being too intense or harsh, unlocks the flavor in a slow succession. Cooking at home doesn&apos;t have to be ordinary or predictable with sous vide. With a little planning and creativity, dinner at home can be as tasty, flavorful and exciting as dinner at a steak house. Overall, sous vide requires a lot of time. The process can take several hours to cook. However, the flavors, texture, and taste are worth it. It&apos;s next to impossible to overcook or burn meat using sous vide, as the temperature control allows for the perfect temperature to remain consistent. See our Sous Vide Temperature Chart. Putting time, thought and creativity into sous vide will always create delicious, flavorful meals.